Can I set MicroBot Push to Repeat? You are able to set your Microbot Push to press repeatedly by following these steps below. 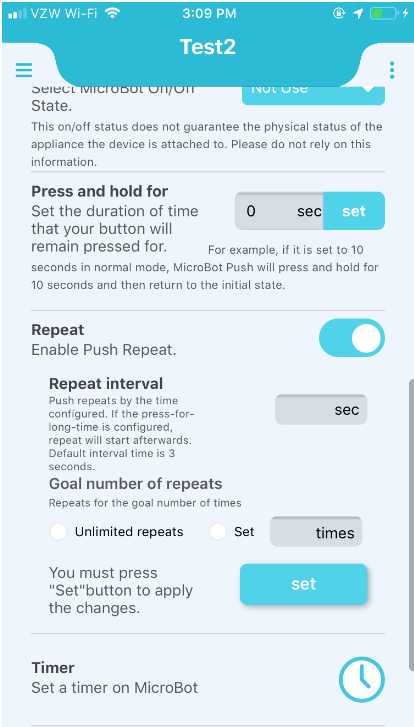 The repeat feature is available for all Generation 2+ Microbot Push units. Prior Generations do not have the ability to update firmware to add improved features such as Push Repeat. Ensure that you are using the latest MicroBot app (iOS or Android) and NOT the MicroBot Push app. Select the right side menu to find this screen below and then use the toggle button to Enable Push Repeat. Set your required repeat interval, for example, every 30 seconds. Then select either Unlimited repeats or Set to repeat a certain number of times. Finally, press the Set button to apply the changes. Pressing the Push button on the app will activate the Repeat series.